Your students will love sitting on the Carpets for Classrooms! Young children need to learn in different environments, whether you take them outside for an hour of instruction or you gather them around on the Carpets for Classroom for story time. Our highly-durable carpets provide your students with a comfortable place to sit during show and tell. We construct our carpets with SoftFlex®, which is an air-texturized, polypropylene, secondary back that is the latest advancement in area rug backing systems. The tightly woven fibers eliminate wrinkles and protect young children from hot or cold classroom floors. Many teacher use the Carpets for Classrooms to insulate classroom floors on cold winter days. The limited lifetime wear warranty is all you need to know about the durability of the Carpets for Classrooms. 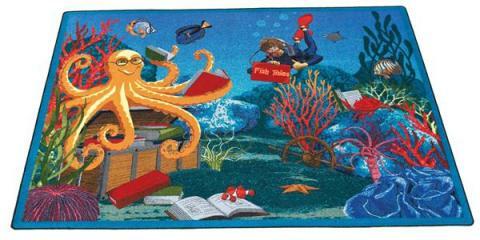 Yet, we designed this carpet to prompt young children to discuss the numerous images that colorfully appear on the carpet. 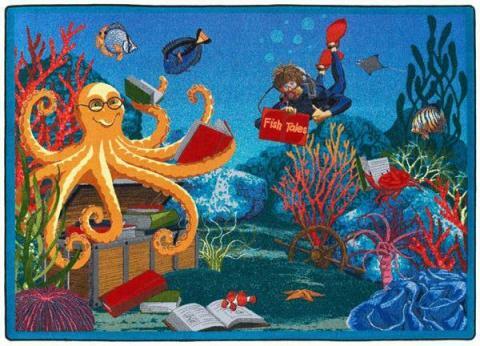 Our design takes young children deep into the water to see all kinds of fish, with the message being to pick up a good book and start reading. Your students will pepper you with the question, "What is that?" Many teacher have said that our educational carpets are one of the best interactive teaching tools that they use.